Crunchy, savory sticks ready to be eaten plain, wrapped in prosciutto, or dipped in any savory sauce imagined. 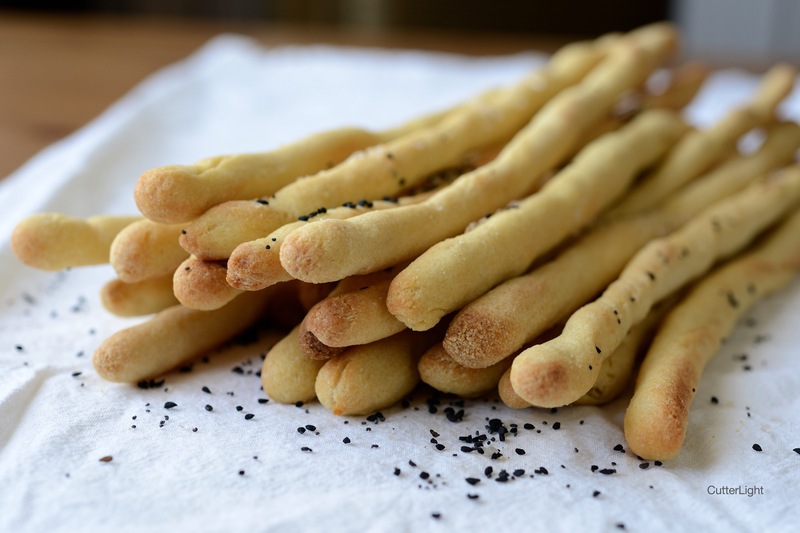 In addition to the rich flavor extra virgin olive oil provides, our grissini were peppered with black sesame seeds, poppy seeds, smoked rock salt, and charnushka. Grissini make a fabulous edible table centerpiece, and they are a cool prop to animate your dinner conversations! 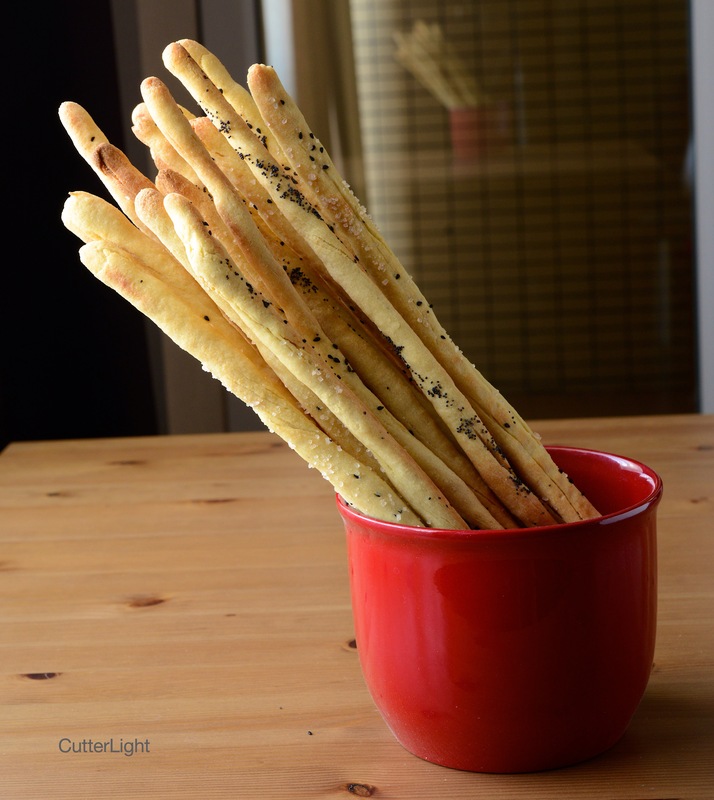 Grissini, Italian-style crisp breadsticks, have long been on my list to make. They are a tasty and fun addition to so many meals. Imagine a romantic Italian meal where grissini are centered on the table alongside tapered lit candlesticks. How about enjoying grissini with a meal of crispy salad and hearty minestrone? The list could go on. Any type of herbs or spices could be kneaded or pressed into the dough before baking. I experimented with poppy seeds, black sesame seeds, rock salt and charnushka. The smoked rock salt was the clear winner in the flavor category, but charnushka was a close second. If you haven’t experimented with this seed yet, now is the time. Charnushka has a moderately nutty, smoky, peppery flavor that I first enjoyed on one version of everything bagels. They worked perfectly on the grissini. Stir water, sugar and yeast together in a large bowl. Let sit for about 5 minutes to ensure your yeast is bubbling and active. Add 1/2 of both flours and the salt. Mix well. Stir in 1/2 of remaining flour. Knead in the rest of the flour. Continue kneading until dough is smooth and flour is well-incorporated, about 5 minutes. Dough will have a slightly coarse texture due to the semolina flour. Lightly oil a large bowl. Place dough in bowl. Turn to coat. Cover bowl with plastic wrap. Let dough rise in a warm, draft-free location until doubled in size, about 1 1/2 hours. Cut the dough into 24 equal pieces. Roll each piece into dough sticks, about 12 inches long, or the length of your baking sheet. Brush both sides of dough sticks generously with olive oil. Press in toppings, if desired. Place 6 dough sticks on parchment-lined baking sheet. Bake for 10 minutes. Flip sticks over and bake for 5 more minutes. Sticks should be lightly browned and crispy. Repeat with remaining dough, baking batches of 6. You’re talkin’ my language now, guys! I worked in three Italian American kitchens before I was twenty-two and have a life long love of anything Italian that I can taste test. Jack, I received your msg and will try to draft something as worthy in return. Stand by, I’m working on it tonight! Good work, you two. Keep it up! Thanks, Cass. These came out really good! I love munching on grissini. These look delicious! I’ve actually eaten these in Italy, and yours look perfect! since I’m a fan of charcuteries. I think this will be great for it. Thanks. We think these would be delicious wrapped in prosciutto!